Although the term “hamster” refers to about 24 species of small rodents, there are only about five found in the pet market. Below is a list of the most common types found as pets. Syrians are large hamsters and can grow to 6-7 inches long. They are usually golden brown with a white belly, but are available in a wide variety of colors and types of hair. The long-haired is often called the Teddy Bear hamster. They live about 2 – 2 1/2 years, often prefer to live alone, and tend to make very good pets. This is the most common type of pet hamster. Campbell’s, the dwarf hamsters, have a length of 3 – 5 inches. These small rodents are usually gray with a white belly. They live about 1 1/2 – 2 years and can do well living together, but also do fine living alone. Due to their small size, they are a little more difficult than other hamsters. Winter White’s, also called Siberian, is another dwarf that can grow to be 4 inches long. They have a dark stripe down the back and a gray-brown color, but in the winter the gray-brown is replaced with a white coat. Life span is about 1 1/2 – 2 years and can sometimes live together. Roborovski’s, another small hamster, grow to be up to 4 inches long. 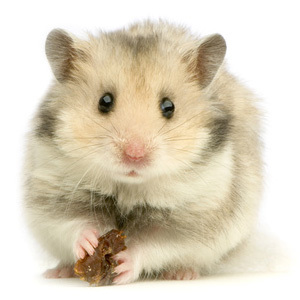 This type of hamster is a brown color and are very quick and curious. Life span is ,on average, 3 – 3 1/2 years and could live in pairs or family groups, but is not necessary. Due to their small size and swiftness, they take a little more work than others, but are still fun companions. The Chinese have a length of 4-5 inches and are also known as striped, gray, or rat-tailed hamsters. They are dark gray with a dark stripe down the back and have a longer tail than other hamsters. They can live 2 1/2 – 3 years and can happily live alone. This cute rodent can be quite gentle and can make a terrific pet.